Slovakia’s priorities for its energy transition have so far been based on its goals of energy independence from Russia, and decreasing its emissions. But as a part of the EU, it should also be promoting the transition to renewable energy. How could this go forward? Veronika Jurcova explains. Like other post-Soviet countries, Slovakia has been highly dependent on energy imports from Russia. This dependency was determined by the east-west orientation of its oil and gas infrastructure. After two gas crises with Russia, however, several measures, such as reverse flow of gas and the construction of more north-south interconnectors have been implemented to overcome this energy security challenge. Slovakia’s energy dependence on Russia is thus gradually decreasing. The energy mix is beginning to diversify, with balanced representation of coal, nuclear, natural gas and a slowly rising share of renewable sources energy sources. The country’s liberalization of the national gas and electricity markets has been rather slow, mostly because of insufficient political incentives. In the gas sector, the main debate has largely focused on security issues and the traditional transit role of Slovakia. The country’s gas transit route capacity is more than 15 times higher than the domestic gas consumption. Nevertheless, only half of this capacity has been used, and with the construction of the Nord Stream pipeline, the transit role of Slovakia is decreasing, as are the revenues from this gas transit. One of the biggest hurdles in the liberalization of the Slovak electricity sector is the dominant role of nuclear power, producing almost 15000 GWh covering 77 % of the total national electricity production. Moreover, two new reactors, each of them with an installed capacity of 440 MW, have been in construction since 2008. Nuclear power will, therefore, continue to play a dominant role in the future outlook. Energy policy in Slovakia is prone to ideological and politically strategic considerations rather than market-oriented ones. One of the most worrying developments is the interference of state and private interests. Most of the major energy companies are publicly owned, as it is the case of the dominant gas market player Slovak Gas Company (SPP), which was re-nationalized in 2014 and is now fully state controlled. Energy security is still one of the major concerns, and the country continues to focus on gas imports and further development of its nuclear power, which has received unprecedented political support across the whole political spectrum. Slovakia is on track for reaching its 2020 targets, however mainly due to its low ambition. The main challenges Slovakia faces in pushing forward its energy transition forward are low energy efficiency, under-pricing of environmental resources, high electricity prices and waste management, as the European Commission sums up. The Slovak 2020 emissions reduction target of 13% will be easily reached, and overall emissions are expected to decrease by 24% compared to 2005. But the most problematic area remains the transport sector, in which the emissions are rising. The main reason for this optimistic outlook lies partly in the progress in energy efficiency and renewable energy, but above all in the negotiated emissions reduction target that has actually allowed an increase in emissions (reasoned as a “right to develop”), as the study of the Slovak Academy of Sciences points out. The share of renewable energy is coming closer to its 14% target and is mostly covered from Slovakia’s traditional clean energy sector based on large hydropower plants. Although there is a steep increase in the number of small hydropower plants (incentivized mostly by subsidies), their installed capacity is rather limited and their environmental impact on river ecosystems quite negative. 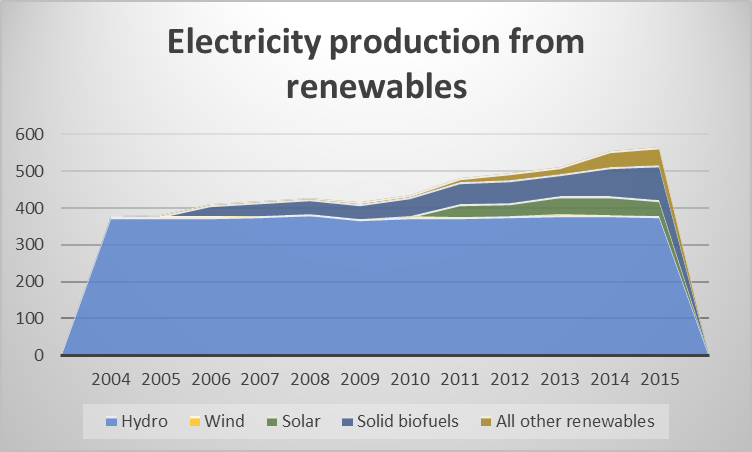 Given the natural conditions, wind power potential is limited, while the shares of photovoltaic and biomass are growing. A small step towards decentralization has been the introduction of the „Green for households“ program that supports heat and electricity production from small renewables systems. As a whole, Slovakia has not managed to exploit its full renewable energy potential. In political debates, renewables have been associated with instability, high costs and intermittancy. Apart from the lack of political willingness and the unfavorable natural conditions for the growth of renewables, one other major problem is related to the capacity of the electricity transmission lines. Moreover, the government still subsidizes coal power plants in order to protect jobs in vulnerable regions. This political and regulatory mind-set has shaped the dynamics of the Slovak energy sector. As a result, current policies and price regulation lead to the highest electricity prices for industry in the region. The lack of political will to change the current status quo is clearly visible in the current negotiation position of Slovakia on the EU Winter Energy Package. Slovakia opposed several measures related to the proposed EU target of 27% share of renewable energy by 2030. The government was against the minimum share of renewables based on the 2020 national targets, enabling access for companies from other EU Member States to national support schemes, supporting ‘prosumers,’ or measures to limit the administrative burdens. So far, Slovak energy policy developments have been reactive to either geopolitical threats or pressure from EU legislation. Low hanging fruits have been collected. However, further progress in energy transition will require more effort, although the Slovak position towards the Winter Energy Package does not bring much optimism in this respect. The construction of interconnections with neighboring countries in both electricity sector and gas sectors has improved to a certain extent the conditions for liberalization. Modernization of the grid is the next essential step. The main problem however is that Slovakia lacks a long term vision and strategy. There is some progress in terms of specific policies and projects, but the Slovak government should be more ambitious in its goals. To fulfill those, Slovakia needs a combination of well-targeted policies that are reasonably using EU funds together with private investments. Last but not least, the government needs to raise public support for energy transition policies. Veronika Jurcova is an international project manager at South Moravian Innovation Center. She is responsible for the Intelligent Energy and Smart Cities agenda. If Poland came off its coal addiction, it would need pumped hydro storage for its wind farms. Slovakia has the mountains to offer this service to its neighbours. Compared to to Slovakia, German emissions per capita are almost 50% higher. Why complain about Slovakia? ?